As a home brewer, people are naturally interested in what you’re making. It’s always fun to share your beer, but one of my favorite things about the hobby is introducing people to flavors in beer that they never knew existed or even could exist. Since my brewery is located off of a well-traveled alley, I constantly get people stopping by to ask questions and sample some of my beer. It’s a lot of fun…not only because I get to meet people and talk beer, but it’s a great feedback loop to have while being able to introduce folks to random styles of beer. For the warm months of summer (the few that we actually get here in Seattle), I wanted to have something that would be refreshing, yet unique, on tap. Since Goses are rarely seen, except by those that seek them out, I thought it would fit the bill nicely with its lemon tartness and orange flavored nuttiness from the coriander. Add in a little salt to the mix and you’ve got a brew that is sure to turn a few heads. For my first batch of Gose, I decided that I wanted to stay fairly traditional. I kept the grain bill pretty simple and standard by using about 60% wheat malt and just a touch of Munich to add a little depth to the malt profile. 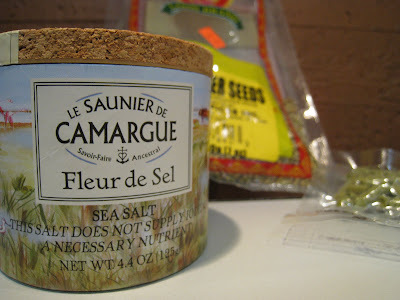 In addition to the sea salt and Indian coriander, which I lightly toasted in a pan and pulsed with a coffee grinder prior to adding, I threw in a few black cardamom seeds for that sort of smoky, mintiness that I feel they sometimes give off. Hopefully it’ll intrigue and not disappoint. 5/2/11 – Added WLP Lactobascillus to 400ml of starter wort and left at ambient temp (68°). Doughed in at 146° and mash stabilized at 139°. Immediately raised the HERMs control to 149°, which took about 6 minutes for entire mash to reach. Left for 90 minutes before raising HERMS for mash out. Collected 5.5 gallons of 1.054 wort. Topped kettle to 8.15 gallons so that after the boil I’d end up with 6.5 gallons of 1.046 wort. Boiled for 90 minutes with spice additions at 10. Chilled down to 120° and let rest covered for 45 minutes. Temp dropped to 112° after which I racked the clear wort into a carboy and then pitched in the lacto culture. Moved into the fermentation chamber with temp set to 110°. 5/9/2011 – Dropped temp dial down to 68°. Created a 750ml starter for the German Ale strain. 5/10/2011 – Carboy down to 68°, so I pitched in the German Ale yeast. 6/7/2011 – Transferred into a C02 flushed keg since I needed the carboy space. Keg was moved up into my office which was about 70° and left unpressurized.